A practical guide and reference doc to help you get started and gain the most value from Unity early access beta tests. Below you will find detailed information about the workflow for submitting impactful bug reports and feedback. Here you can also find a summary of the most important steps. Download the latest beta build, either directly as a standalone installer or via the new Unity Hub. This page also contains lots of beta information and resources. You can learn about new features, find helpful documents and tools, and stay informed about the latest sweepstakes. Run the Installer or the Hub. If you use the installer, be sure to install the beta in a new directory. It’s ok to have multiple versions of Unity side by side, as long as they are located in individual directories. Start a new project or make a copy of the project you plan to use for testing the beta, then open it with the latest beta version. Make sure you create a backup copy if you decide to run an existing project in the beta. Backwards compatibility is not guaranteed, so once you upgrade your project it might not be possible to revert it to a previous version. Note that when Unity opens a project, it automatically migrates the project to the version of Unity you’re using. So working on a copy of your project also saves you time because you avoid having to re-import when you go back to your current stable version. So… you found a bug. This is how you can help most efficiently. Check the issue tracker for existing bug reports. Google the issue and look for related forum threads. Is it a known unresolved issue? Vote for the relevant issue tracker entry. Is it an unknown issue? 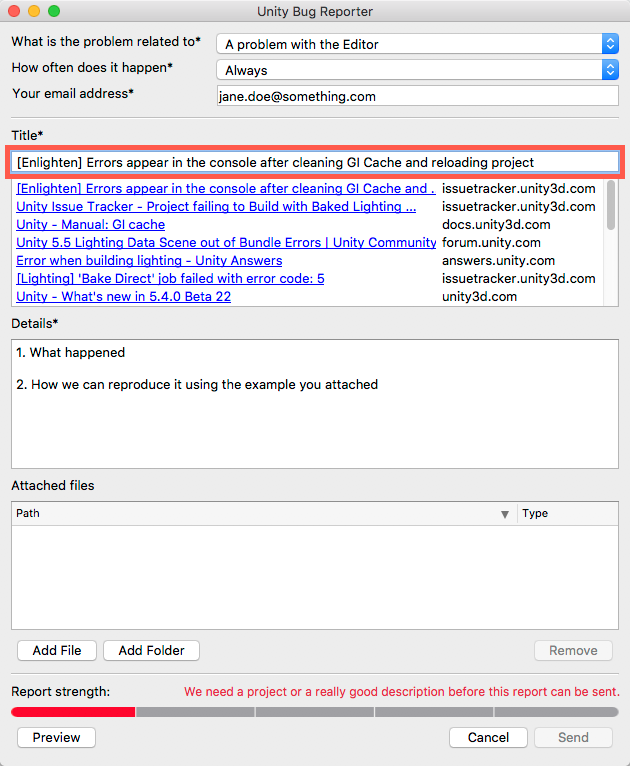 Submit a bug report with a minimal reproduction project and respond to requests from Unity personnel. Was the issue already reported, but you want to make sure your case will be covered by a fix? Is there an existing forum thread about the issue? Reply. If not, start one referencing your Issue ID. 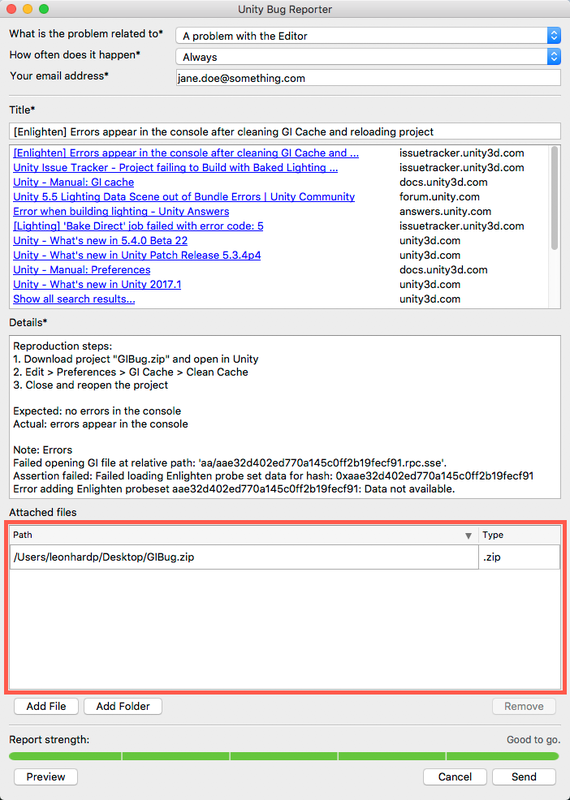 If you run into an issue with Unity, the first thing you should do is to find out whether it is a known issue or if you’re the first to experience it. The first address to get this kind of information is our public Issue Tracker. It allows you to search for bugs reported by other users and vote or comment on them. Voting on issues helps our team prioritize which bugs to tackle first. The Unity beta forum is another great community resource. You can see what other people have reported, find workarounds for issues, or provide information yourself. It’s also a good way to get in touch with someone at Unity. Just make sure that the subjects you’re raising are related to the current beta, and don’t bundle multiple different issues in a single thread. If you don’t find anything related to your bug, then it’s time to submit a bug report. 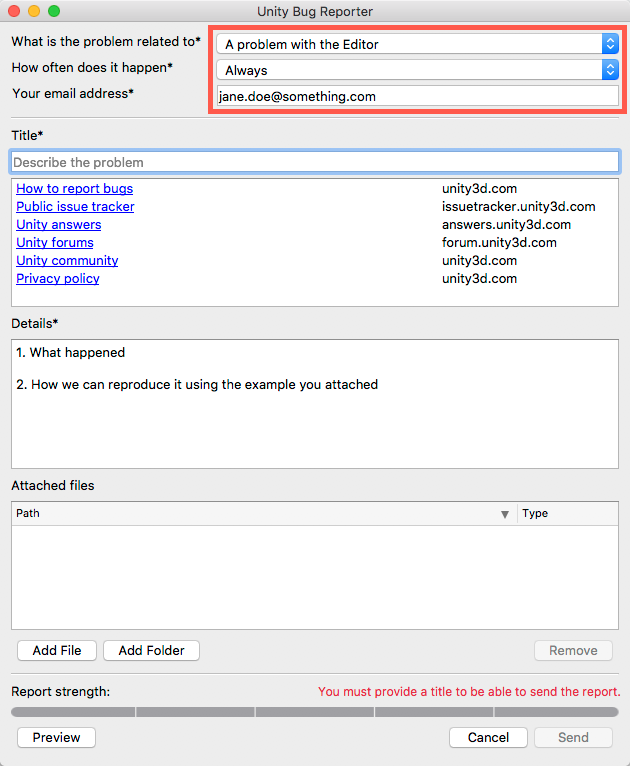 Once you’ve submitted a report, it’s also a good idea to come back to the forum and post a description of the issue you’ve discovered. Doing so will enable others to inform themselves and add more context or provide their workaround. It will also speed up processing times, since we’re monitoring the beta forum frequently and prioritize the initial assessment of new cases that are discussed there. If you start a new thread about an issue, please make sure to include your Case number (provided in your confirmation email) in the post so that our team can identify the bug report you submitted - it’s the first thing they will ask if you leave it out. If you’re in doubt whether an issue points towards a bug in the platform or your project and consulting the forums or documentation doesn’t bring certainty, please go and submit a bug report anyway. Bug reporting can seem a bit intimidating at first but it’s really not so tough, and it is vital to ensuring stability. Follow these simple steps to write a good bug report that our engineers will be able to easily understand and act on. Don’t be afraid of making mistakes. If we can’t reproduce an issue with the information provided in your report, we will get in touch with you to figure out if something is missing. 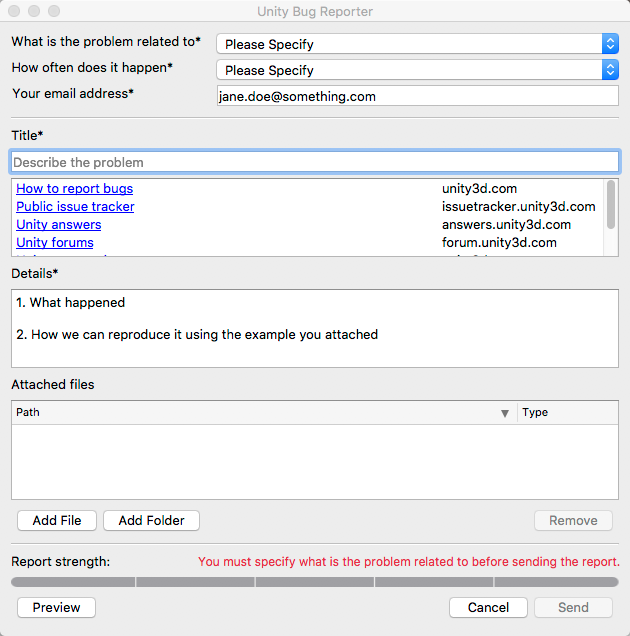 While running Unity, go to Help → Report a Bug in the menu. Alternatively you can find the Bug Reporter installed next to the editor in the program folder. It will also launch automatically if you experience a crash. Provide your email address in case our team needs to contact you for more information. If you’re logged in with your Unity account, this field will be filled automatically. If your report gets verified, the text written in the “Title” and “Describe the problem” fields will be made publicly available in the Issue Tracker. This helps the community. Other users will be able to comment, vote (which aids with prioritization for fixes), and see when a fix is available. None of your personal information will be published. Your projects and other attachments are only accessible to Unity employees. If you had to categorize the bug, what would you pick? UI? Asset import? Scripting? Specific platform? Crash? In this case, the bug was related to lighting and more specifically to the Enlighten lightmapper. Keep doing this as far back as you can remember, ideally to when you first opened up Unity. The more information you can provide, the easier it will be to reproduce and fix. If you can’t remember everything, see if you can reproduce the bug and pay attention to the steps that you’re taking. Note, that if you encounter unexpected error messages it is helpful to add those to the description as well. The Bug Reporter will automatically include the currently loaded project in the bug report if you open it through the editor. If you start the reporter via its executable file, you will have to attach your project manually. Unless your project is already very small, it is recommended to strip it of irrelevant assets. Submitting a minimal reproduction project that only contains what is necessary allows our QA and Development teams to isolate the issue more efficiently and provide a fix much faster. If the issue occurs in a specific scene of your project, try exporting the scene in which you encounter the bug, then import it into a new project and see if the bug still occurs. If it does, upload the new, smaller project. If it doesn’t, you can keep trying with larger versions of the project. To ​help ​you ​reduce ​the ​size ​of ​your ​projects ​and ​to ​create ​minimal ​reproduction projects, ​we ​developed ​several ​tools ​that ​greatly ​reduce ​the ​required ​effort. You ​can ​find ​additional ​information ​on ​how ​to ​use ​these ​tools here. The smallest project that recreates the issue is ideal, but large projects are definitely better than nothing, so please do include your whole project if you’re unable to narrow it down. Our ​reporting ​system ​supports ​huge ​attachments. Please ​do ​not ​upload ​individual ​assets ​because ​the ​project ​contains ​relevant ​data and ​files ​that ​the ​assets ​alone ​do ​not. When your bug is submitted, you will be sent a confirmation email containing the case number, which you’ll need to hold on to. The email will include a link to a web page with the current status of the bug. You can check back on that page anytime for an update. Don’t share this link on the forum or other public spaces, as it reveals your contact address and bug report history. The case number is sufficient for others to find the issue on the Issue Tracker. It is always ideal for our staff to be able to get in touch with you in case they have questions. If you submitted a bug report, we will reach out to you via email. If you wrote in the forum, we will reply there. Please respond as soon as possible to questions and requests you receive from the team to ensure a speedy resolution of the case. If you didn’t see your bug mentioned in the forums, we advise you to start a new thread. Remember that others may have experienced the same problem, so posting any workarounds you find is a fast way to make friends in the beta community! Thank you for taking the time to learn how to be an effective beta tester. If you have questions about any of the above and your search engine of choice doesn’t reveal any answers, please drop by at the forums and ask.